From Michael Russo at the Minneapolis Star Tribune: Make the home a green version of the current roads, and we're done here, boys. This might not be the right thread for NHL trash talk. Besides that, you don't really have an excuse to trash talk if you're a Flyers fan. Dave Hakstol will right the ship!Back on topic, Hawks throwback is awesome! Memorial Day 2015: FTWGA. Who in the flaming hell is Dave Hakstol? On topic, that Hawks logo looks like something the D-League would hack up. But borrowing the word "ski" from Sioux language and bastardizing it by adding "U-Mah" to make it rhyme with "rah rah rah" isn't an honor, is it? NCAA, where are you???? ?Except that ski-u, ski-oo, or ski-yoo arent Sioux words for victory either but was used as exclamation after winning a canoe race against Minnesota that the captain heard and then added mah to rhyme with rah.http://www1.umn.edu/twincities/traditions/Minnesota's own web site proudly lists this "Sioux" word along with an explanation for its origin. If the NCAA can put the hammer down on William & Mary for previously using a feather in its school logo, surely this must raise a few eyebrows. No way you're being serious with this. If he's the mafiaman I think he is, then no. No he's not. Well, maybe halfway. #1, and it's not even close: March 24, 2006. The Minnesota Gophers hockey team loses in the 1st round of the NCAA tournament to Holy Cross in OT, in Grand Forks, in front of a building full of Sioux fans. I don't think I've ever heard an arena that loud, and it's made all the worse by the fact that my wife and I were in attendance, and had to listen to Sioux fans jawjacking us everywhere we went that night. For those who are unfamiliar with college hockey, Minnesota and North Dakota are blood rivals, even though we're not in the same conference anymore. North Dakota fans *to this day* will show up at games wearing Holy Cross jerseys and t-shirts. Bad night. REALLY bad night. #2 1998 NFC Championship #3 2009 NFC Championship #4 2001 NFC Championship: Giants 41, Vikings 0. Flip it 90 degrees clockwise. So what does the M mean when you flip it 180 degrees? Miz. Up here in Minnesota, there are a lot of people asking the same thing of Suter. The Vikings stadium bill just passed the Minnesota House 73-58. Yay. As a rabid college hockey fan, white = home to me. It's still jarring for me to tune into an NHL game and see the home team wearing colors. I doesn't keep me up at night or anything, but given my druthers, I'd have the home team in white. Same here. The black facemask is unnecessary, but it doesn't look terrible either. Really, it's not a bad set. As long as they don't start wearing the Nike-mandated black and/or silver uniforms, these will be just fine. The black facemask only looks good with the white jersey since the numbers and collar are black. Maybe they'll change the facemask each week to match the uniform. The numbers/collar on the white jersey are maroon, not black. I really like these, even with the black facemask. 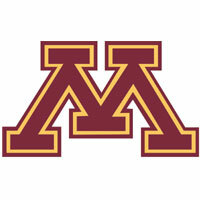 If I had my druthers though, I'd set the maroon/gold combo as the permanent home uni and the white/maroon as the road. Considering that the white helmets they wore a couple of seasons ago went over like a wet fart in church, I'm betting they'll only have the one helmet. At least, I hope that's the case. Here's the final helmet teaser for Minnesota. Full gallery tomorrow: Black facemasks. Bleah.